The center of gravity of global challenges and opportunities are shifting rapidly toward Asia. ASEAN and the Asia Pacific region has become one of the focal points of India and Russia’s foreign policy, strategic concerns and economic interests. From the economic perspective, the region has seen a strong surge in prosperity. India and Russia’s relations with the Asia Pacific region have grown considerably over the last decade, but a vast potential still remains untapped. Asia Pacific region has considerable strengths in the old economy and has lot of ambitions in the new economy. There is a huge potential in this region for developing the mutually beneficial research and business partnerships. Apart from economic cooperation, there is much more, where India-Russia can cooperate with the Asia-Pacific region. Cooperation on borderless issues such as terrorism, nuclear proliferation and piracy is important to strengthen the regional security architecture. Traditional regional distinctions have lost meaning, because of the global nature of the challenges that countries are facing today. There is a need to confront terrorism, which neither respects power, nor heeds size. Today apart from India and Russia, even Asia-Pacific regions orderly society is facing this menace. There is a need to protect the common commercial sea lanes, combating piracy, choking off narco-trade and curbing gun-running. There is a need to tackle these problems jointly in a determined manner through regular exchange of experiences, information and intelligence. Today there is a need to formulate cooperative security framework. The recent trends indicate that the power of technology and a globalised economic system will dominate the world structure. Ethno-nationalist violence and terrorism fed by extremism are one set of impeding factors, which need to be suppressed and eradicated. Terrorists exploit the freedom which their societies guarantee to the people. It has also become clear to the international community that terrorism can be tackled and curbed only with a global and comprehensive approach. India realizes Russia’s strong trade and financial influence in the Asia Pacific region and recognizes Russia’s renewed engagement in the region supporting the continuation of economic prosperity. Future of Asia is vital to India as well as to Russia, past links of trade and culture in the region has left a lasting impact. The trade and economic ties that India & Russia maintains in Asia proves India and Russia’s meaningful presence in these markets. Today both India and Russia is strengthening regional partnerships through international institutions and bilateral agreements. Additionally, India & Russia continues to work on an economic framework with ASEAN countries. Recently India has articulated a vision for the Asian economic community and the web of free trade agreements are creating a foundation. These engagements are going to be not only economic, but strategic and political in nature. The key partnerships such as the ASEAN-Indian partnership in addition to regular summit meetings are enhancing the relationship further. Russia’s President Dimitry Medvedev recently in his speech at the opening summit of the Boao Asian Forum mentioned about the opportunities for economic cooperation between Russia and the countries of the Asia-Pacific region. He proposed that during Russia’s chairmanship of the APEC forum next year, Russia would conduct the APEC summit in Vladivostok in 2012 on the theme of “cooperation for modernization”, to bring to the forefront the activities of the theme of cooperation with modernization aims. According to President Medvedev, today APEC has become the most influential and representative regional body and can play greater role in creating good conditions for developing modern comfortable cities, promoting free movement of goods, capital, services, and labour, exchanging the latest experience and technology and encouraging innovation, putting into practice the principles of inclusive development. According to President Medvedev, Russia’s efforts to modernise Siberia and the Far East are intricately linked to the Asia-Pacific region, hence, Russia has deep interest in this regions rapid development. High-technology sectors, modern energy, transport and logistics systems are the sectors in which Russia hopes to add value and increase the regional cooperation. Another major area of cooperation between Russia and the Asia-Pacific region is in the disaster prevention and relief. It is clear that the robust social and economic development in the Asia-Pacific region is possible only if one can create an open, transparent and equal security and cooperation architecture based on the principles of international law and taking into account the interests of other friendly countries. India's close contact with the region is also due to its civilisational links with the region, which goes back over a millennium. Historically, India has been linked with the region through culture and commerce. India and the regional maritime centers like Singapore played leading roles in flourishing trade within Asia, shaping the historical development of this region. The cross-fertilization of human experiences and the spiritual interaction between India and ASEAN region has left an indelible mark on the regional art, architecture, language and culture. It is a fundamental fact of geography that India is in the immediate neighbourhood of ASEAN. India shares land and maritime borders with Myanmar, Indonesia and Thailand. India's Andaman and Nicobar Island in the Bay of Bengal are closer to some ASEAN states than to the Indian mainland. The vital commercial sea lanes between West Asia and South East Asia straddle the Indian mainland and its island territories. During the first few decades after India’s independence, India did not concentrate much on developing the relationship with this region mainly due to the divergences in economic ideology, political outlook and security assumptions. However, gradually India removed the hurdles and started developing close India-ASEAN cooperation. India became a sectoral dialogue partner of ASEAN in 1992, full dialogue partner in 1995 and joined the ASEAN Regional Forum in 1996. India’s Dialogue Partnership has been active. India was always sought to integrate India's strengths in various social, scientific and economic sectors into the relevant ASEAN processes. Reflective of India's interest in intensifying its engagement with ASEAN, India is in the process of jointly developing India-ASEAN Vision 2020, as a roadmap to achieve mutually desired objectives. India recognizes the pragmatic logic of pursuing specific socio-economic goals in the region through sub-regional groupings. India strongly supports Mekong-Ganga Cooperation, bringing together Cambodia, Laos, Myanmar, Thailand, Vietnam and India. India has also offered India’s assistance to the Initiative in the development of a communications network involving highways, railways, river navigation and port facilities. India has a constructive and multi-faceted relationship with every major country of the region. Indian economy is now rapidly integrating into the global mainstream. 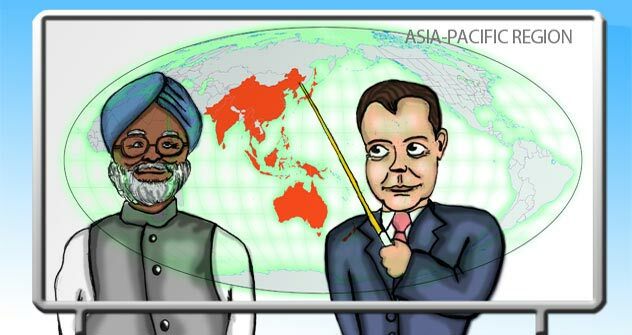 India’s linkages with the major economies of the Asia Pacific are becoming stronger. This together would reinforce development, peace, security and stability in this region. India's belonging to the Asia Pacific community is a geographical fact and a political reality. It does not even require formal membership of any regional organization for its recognition or sustenance. India and ASEAN are now poised to intensify their political and security dialogue to add new dimension to a mutually beneficial economic and commercial relationship. The current global economic slowdown should also urge to explore more avenues for generating and meeting demand on a regional basis. The move towards greater economic liberalization in the ASEAN Free Trade Area and the ASEAN Investment Area reflects this recognition. India as well as Russia seeks mutually beneficial partnership in this endeavour. To promote such creative inter-linkages a multilateral dialogue can be very effective. It seems both India & Russia looks forward to such dialogue with this perspective. The countries of ASIA-Pacific region as well India and Russia today are at the forefront of developing and introducing cutting edge technologies into their economies. They all are in the epicenter of the Knowledge Revolution. This provides all these countries with a major opportunity to overcome the historical disabilities and to compress the time gap between successive levels of development. All these countries have achieved expertise and even dominance in certain areas of technology. There are many possibilities, which need to be explored. Therefore, it is crucial that all these countries together should cooperate in exploiting the synergies between each other. Nivedita Das Kundu Ph.D. is a Foreign Policy Analyst and Assistant Director in the Indian Council of Social Science Research, New Delhi, India.